As a top tier supplier to the aerospace engineered materials market known for our technology leadership and the value Solvay brings to our customers: scale and technical capability, profitability in the top quartile of peers, double-digit earnings growth in previous business cycles. Combining 50 years of technology heritage, a comprehensive product portfolio and expertise in design materials and process engineering to deliver innovative customer solutions that maximize technology capability and simplify manufacturing. We also provide advanced composite and adhesive materials for extreme-demand environments, radical temperature changes, aircraft material expansion and contraction and other external conditions. Product portfolio for Solvay's Composite Materials solutions. Solvay is a premier supplier of composite materials for the aerospace and industrial markets. Customers use our advanced material solutions for unique and demanding applications with complex geometries and varied life cycles including: primary and secondary structure, interiors, aircraft engines, tooling and other applications where a combination of lightweighting, mechanical performance and design freedom are required. Solvay's prepregs and resin systems are the industry standard for stiffness, impact resistance and thermal performance. We offer flexible processing options to enhance design freedom and lower manufacturing costs. Our knowledgeable, experienced technical support and account teams help our customers develop complex and comprehensive aerospace composite solutions. Thermoset Prepregs - The majority of our products are thermoset composites used in a variety of applications in aerospace, automotive, oil and gas, and more. When the resin matrix and fibers are combined, an irreversible chemical bond is created when the molecules cross-link in the curing process and cause the material to be set in its final form. Thus, the material can not be remolded, reused, or recycled. However, the material’s heat resistance, stability, flexibility, and durability make it a prime candidate for cost-effective, yet high-performance design. View our entire portfolio of thermoset products. Thermoplastic Prepregs - Thermoplastics provide efficiency to the aerospace market, environmental resilience to the the oil and gas market, and performance and durability to the automotive market. Because curing is not necessary, the use of thermoplastic composites tend to increase manufacturing rates. Thermoplastic parts are fabricated through rapid consolidation techniques such as compression molding, stamp forming, or pultrusion. High-impact resistance, reshaping capability, and eco-friendly manufacturing options make thermoplastics a leading solution in the composites industry. View our entire portfolio of thermoplastic products. Manufacturing composite parts involves creation of a mold to form the material. For part manufacturers, tooling materials require high dimensional stability and appropriate durability depending on the number of cycles. Solvay offers epoxy- and BMI-based tooling materials. Both types offer superior handling characteristics and molded surface quality, which are important in assuring accurate manufacture of composite parts. Solvay approaches composite tooling by focusing on developing material to meet future demands. Through our focused engagement in collaborative research and development programs with government, academia and industry bodies, we are able to push the boundaries in function, cost-effectiveness, durability and robust processing. Manufacturers rely on Solvay for world-leading adhesive technology and top quality products. Our adhesives are suitable for composite-to-composite, composite-to-metal and metal-to-metal bonding. 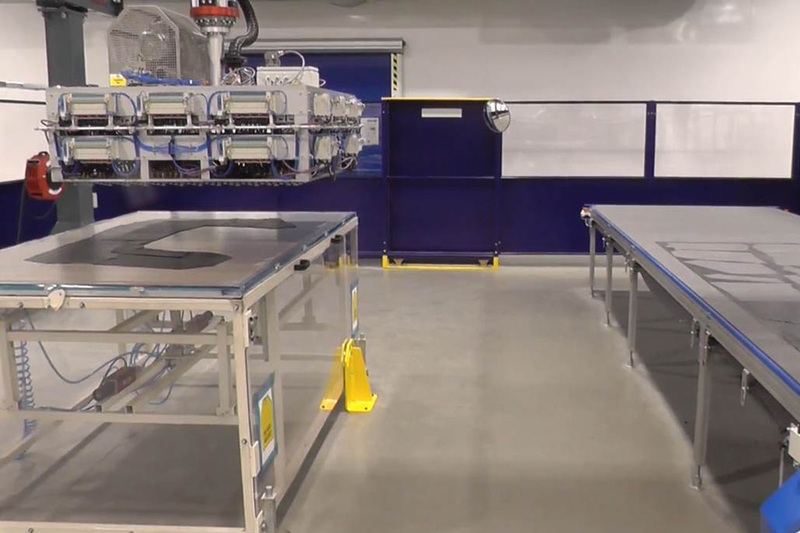 Our products are designed to address the challenges that customers face due to varying substrate materials, robotic assembly processes and an infinite combination of production environments and performance requirements. As the leading supplier of aerospace adhesives, our products are qualified for use on aircraft programs and are proven to perform in demanding applications. We formulate and manufacture a comprehensive range of molding surface improvement epoxy films fully compatible with our out-of-autoclave processable prepregs. These films are formulated to provide a range of surface options, including tough and high visual quality finishes, or sandable and paint-ready surfaces all direct from the mold, most with either no or minimal reworking prior to use. Our full portfolio of adhesive, surfacing films and primers are available in a variety of product forms to enable manufacturing flexibility. Our knowledgeable technical and account teams provide exceptional support to help customers develop solutions for their rigorous adhesive and surfacing applications. View our entire portfolio of process materials. 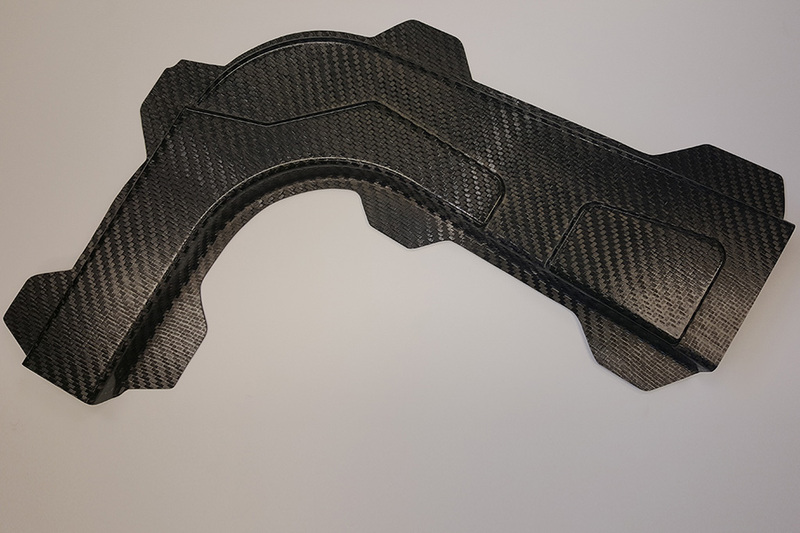 Carbon fiber products offer advantages for advanced material solutions such as light-weight, high-tensile strength, manufacturing flexibility and heat resistance. Solvay offers a range of carbon fiber products that deliver superior structural, thermal, electrical and frictional performance for a variety of unique applications, including brakes, defense systems and commercial aircraft. Solvay offers fully-qualified aerospace materials in smaller order sizes and quantities through our Aerospace Materials Small Order Service (SOS) Center. Solvay's Composite Materials Application Engineering expertise is key to the business leadership. Our teams are dedicated to developing new composite products, technologies and processes to meet the affordability and higher-rate needs of our customer's industries. We work collaboratively with our partners and customers to develop solutions that meet the market expectations in terms of lightweighting, design freedom, part and system integration. 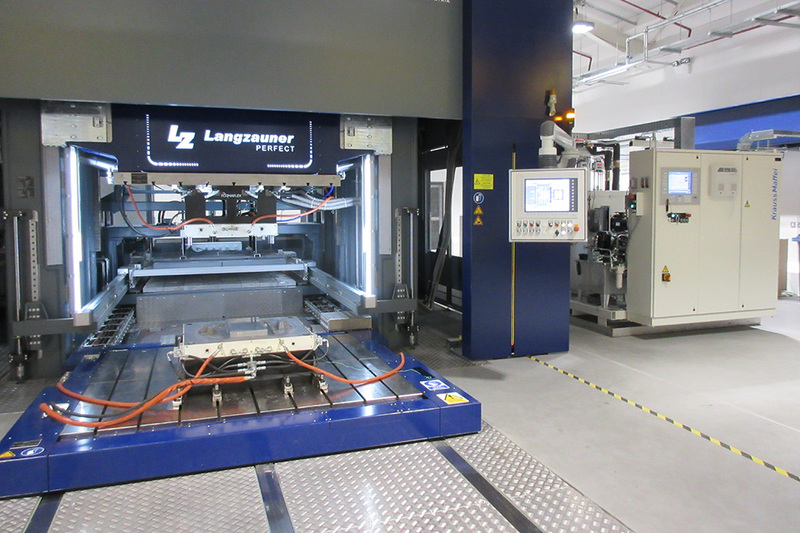 We put a strong focus on automated systems that will be key to the industrialization of composites. 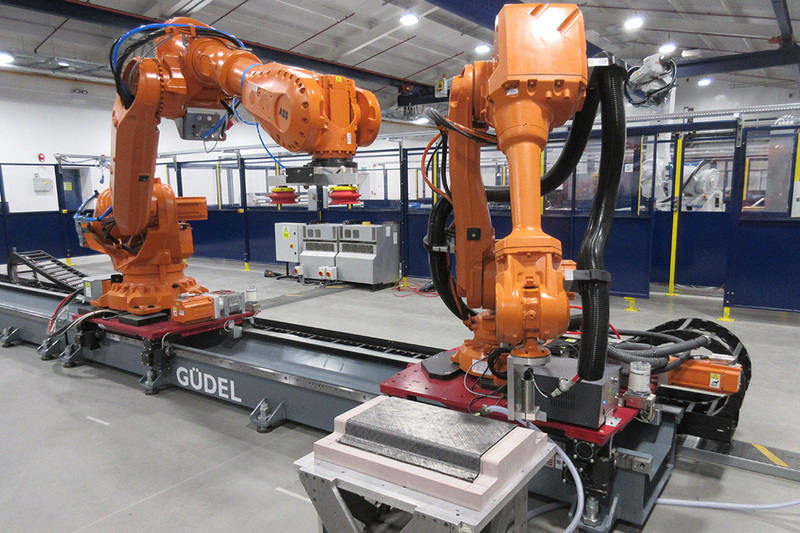 Our Application Center in Heanor, UK, is fully equipped with robotic equipment and is the test bed for many of our new technologies. Hot compression molding is a method of molding in which the composite is first placed in an open, heated tool. The tool is closed and pressure is applied to force the material into contact with all tool areas, while the heat and pressure are maintained until the material has cured. Reduced tooling investment (vs metal forming processes). Resin infusion technology is used to manufacture composite parts for aerospace primary and secondary structures such as engine fan blades, composite wing boxes and spoiler components. This technology allows parts to be efficiently integrated and cured in a single process resulting in fewer drilled holes and a lighter weight structure through eliminating the need for fasteners and adhesives. Resin systems including PRISM® EP2400, CYCOM® PR520, CYCOM® 890 and CYCOM® 823 RTM. Dry engineered textiles including PRISM® TX1100 which has been developed for automated processing. Process materials designed for the infusion process. Aerospace primary structure applications such as engine fan blades and composite wing boxes. HP-RTM combines hot compression molding with resin injection. A dry pre-consolidated preform is inserted into the mould mounted in the press. Once the press is closed and at the right temperature, the specifically developed HP-RTM resin is injected at pressures up to to 200 bar, filling the tool and flowing all throughout the preform. Total takt time of sub 5 minutes depending on part size. Highly automatable processing (preforms through to post mold processing). Structural integrity on hot demolding with Solvalite™ 750. Particularly suited to complex geometries. Serial manufacture of automotive body structure components such as floor pans, sidewall panels, crush cans, bulkheads. Solvay has developed automation technology for the creation of tailored composite blanks for single step molding. Suitable for a variety of manufacturing processes; including preforming for RTM/HP-RTM as well as for the manufacture of prepreg composite components. Flexible cell equipment can support multiple components with a tool and program change. Solvay has developed a novel forming technology called Double Diaphragm Forming (DDF). This method automates dry fiber pre-forming, prepreg pre-forming or press molding into a single-step process speeding up the takt time involved in part making. The DDF technology also cuts down on labor cost and processing time due to the two diaphragm layers preventing the need for tool preparation and cool down between moldings. The diaphragm itself can act as a protective layer for painting and bonding operations. This new technology is easy to implement because it can be tailored to your current press infrastructures. The DDF technology has already proven its capabilities in terms of part quality, process accuracy and repeatability. Solvay is now working to scale up the process towards industrialization readiness by developing an automated pilot production line, enabling a sub 5 minute takt time and a highly automated process. When looking at serial production of CFRP parts, recycling becomes a key part of the equation. The opportunity in recycling prepregs is how to strip away the resin from the fibers while preserving the properties of the fibers and therefore enabling these to be reused to manufacture parts. The focus when recycling dry fibers is to recover the fiber with minimal impact to the fiber length to preserve mechanical performance. Targeting elimination of prepreg offcuts. 100% utilization of the composite materials; this is typically achieved when pressing sheet metal. 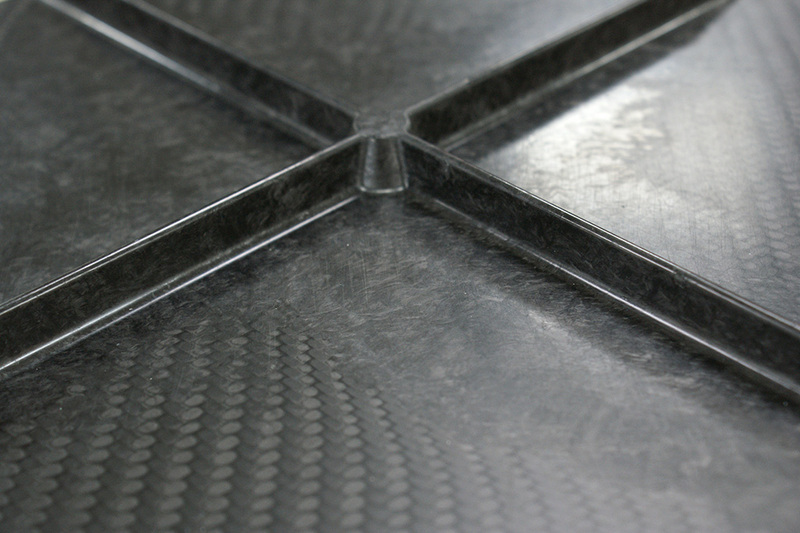 Eliminate disposal of valuable carbon fiber products. Solvay’s recycling technology enables the production of a Recyclate Molding Compound. Allows for the addition of localised features and overmolding bosses, ribs, inserts etc. Can enable 100% material utilization. Non structural components such as brackets, ribs, bosses, etc. Composite materials may require cutting at different stages during the manufacturing process of a component. Firstly, the dry fiber or prepreg will be cut to an approximate shape and size prior to laying-up in the mold as a preform. Net-edge trimming of the preform may then be performed to reduce post-curing machining operations, or the component may be machined after curing to achieve the finished part geometry. 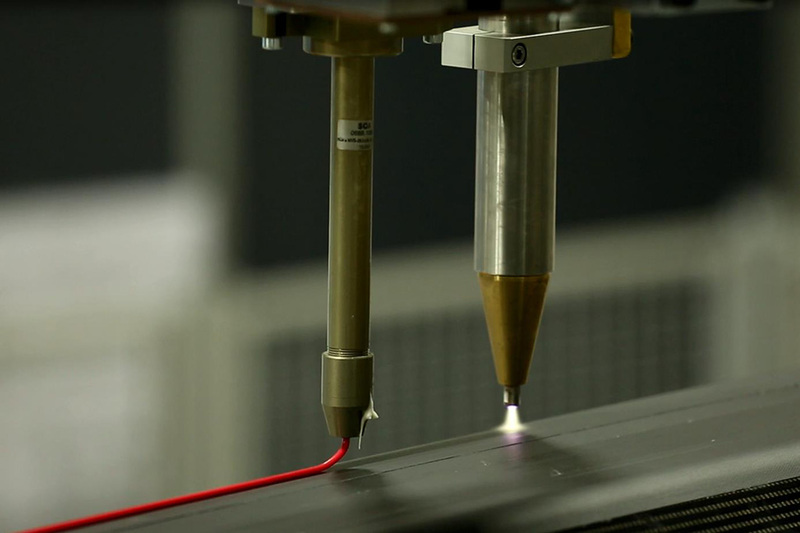 A variety of different methods can be used to cut uncured composite materials. 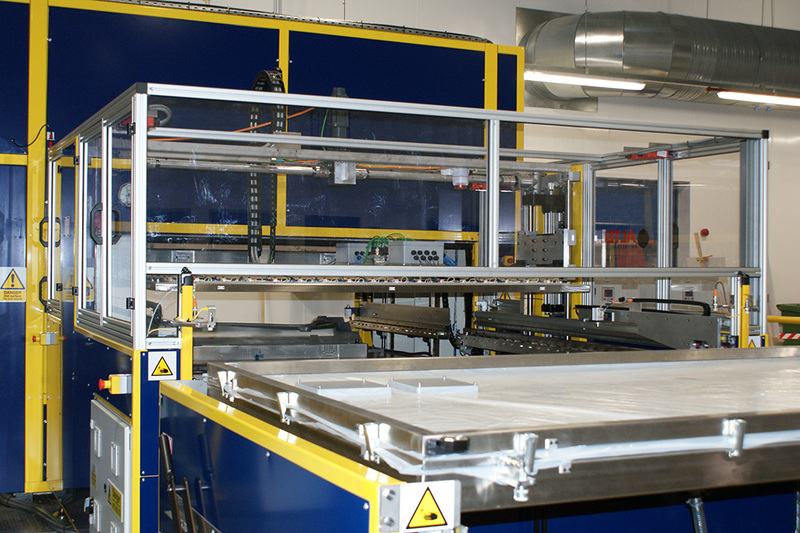 The most well established is the use of an automated ply cutting table. This consists of a ‘moving bed’ with a cutting gantry that runs above the bed. The gantry houses either an ultrasonic cutter or a ‘powered wheel’ cut. The ply shapes are pre-programed into the ply cutting table and when needed, the roll of material advances along the table to the cutting zone, where a drag knife, or ultrasonic cutter are present and able to perform the cut. “Net-edge trimming” of shaped preform laminates (parts that have been laid-up and contoured to shape, but not yet cured) is a new technique that has been developed to reduce the amount of scrap trimmed from a part after the part has been cured. The final geometry of the part is cut-out by ultrasonic blade. Reduces the amount of post-curing machining operations required, in some cases the part can be used as-is. The waste fiber can potentially be recycled without the need to extract the fiber from cured resin. Trimming of cured parts is a standard step in composite part manufacture to achieve final-part geometry and for any hole drilling/cut-outs required. Various cutting techniques are available: rotary cutter (machining) and waterjet are the most common, whilst laser trimming is currently in developmental stages for composite materials. The techniques can be used either on standard robotic arms or multi-axis CNC machines. Design for Manufacture – avoiding wipe-off, ensuring consistent gaps, etc. Solvay’s global team of composites experts are ready to respond to your inquiry. Please email our team of sales experts at custinfo@solvay.com, and they will connect you with the right person to provide the answers you need. Because of our broad portfolio and the varieties of markets we serve, we ask you to include a detailed description of your anticipated needs. The more details you are able to provide, the faster we can locate the right specialist.